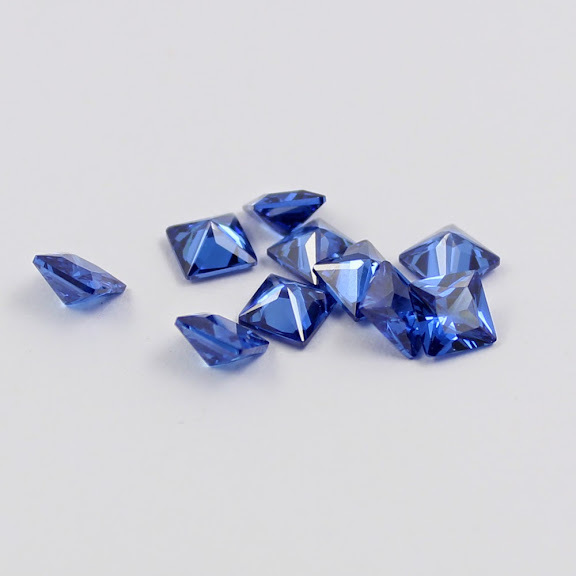 Blue Cubic Zirconia CZ Stones Blue Synthetic Gemstones Lab Created Gemstones is popular stones for jewelry creation. Cubic zirconia (also called CZ) is a synthetic crystalline substance used as an affordable alternative to diamonds.Cubic zirconia has a rating of approximately 8.50 on the Moh's Scale of Hardness. The denseness of cubic zirconia makes it about 75% heavier than diamonds. Though much less expensive than diamonds, the brilliance and crystal clarity of cubic zirconia make it one of today's most popular stones for an attractive-yet-inexpensive, diamond-like jewelry. Color blue cubic zirconia is difference from natural blue zircon and see below pictures for your reference. asscher, radiant, emerald, concave, water drop, teardrop, briolette, trillion, tapper, cushion, marquise and much more. We are manufacturer of loose blue cubic zirconia stones and provide affordable wholesale prices directly from factory. We supply the best quality AAAAA blue cubic zirconia with excellent spark.